I guess we're halfway through Summer now, which means I can totally start thinking about my Autumn wardrobe, right? To be honest most of my wardrobes are full of transitional pieces, with only a few items taken out at the end of Summer and put away until next year. The items above are pieces I've had my eye on for a while - the Oskia Renaissance Cleansing Gel is my go-to cleanser at the moment, and I'm running out so I need to stock up on it, stat! These Topshop floral trousers are perfect for that transitional part of the Summer, and I can totally see me rocking these in Autumn with a lightweight knit and ankle boots. 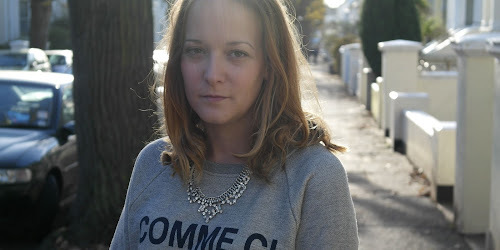 Having a capsule wardrobe has been on my mind a lot recently - I like the idea of having a streamlined wardrobe with simple, but nice pieces to wear, and I've decided that I need to purchase a few investment pieces ready for me to start this capsule wardrobe thang (any excuse to shop, am I right?) I think every woman should own a leather jacket - it's the ultimate wardrobe item, and going for a simple design is the perfect 'investment'. This Whistles leather jacket is right up my street, and I'm definitely going to think about making a purchase very soon. Comfort is key for me, and although I already own these Nike Mayfly trainers, I don't have them in this colour. Believe me when I say - you need these in your life! They are the most comfortable item of footwear I have, and I'm going to be overly dramatic here and say they will change your feet's life. For real. *may = I totally did! Every season you find that there are a few key items from the high street that just appear all over Instagram. There's that Zara coat, those lace-up flats and the gingham off-shoulder top from Topshop to name a few. Instagram is the place for style inspiration. I'm always looking at the accounts I follow and lusting over the latest OOTD, and as it's pretty much in real-time you're bound to double-tap that item you've seen on someone's account and be able to walk in to the shop it's from and purchase straight away. This happened with these beauties above. The KG Kurt Geiger lobster backless flats named "Otter" were love at first sight. A little 'out there' for me, but as soon as I saw them, I had to hunt them down on Kurt Geiger's website. Less than 24-hours later, I had them on my feet - if that's not 'fast-fashion' then I don't know what is. London has so many bars, and it can be a little overwhelming to choose a place to go out. I have a few favourites, but I’m always on the lookout for new places to try. Six storeys is based in Soho, London. The bar is spread across a six-floor townhouse overlooking Soho Square (hence the name) it’s full of character; with a lobby bar, parlour, lounge, decantery, study and loft all are beautifully decorated. There’s even an old school drinking den, with a huge bed to chill out on whilst drinking cocktails. The thing about Six Storeys that stands out the most, is that all their alcohol is blended on site. You won’t find any alcohol brands behind the bar - instead huge kilner jars housing very interesting flavoured gins, vodkas, rums and scotches adorn the shelves, making the place feel a little more mysterious than other bars in the area. Cocktails that they offer on an intriguing menu full of weird and wonderful flavours include; Quince and blue cheese gin and tonic, strawberry and basil vodka Martini and peanut butter rum Old Fashioned. I was lucky enough to win a competition they were holding on social media, to come and hang out at the venue and take part in a private cocktail masterclass with Patrick, their ‘chief booze engineer’. We had a great time tasting a few of their blended concoctions, and even helped patrick create some new flavours ready for the staff to serve up to guests in a couple of months time. We got to make our own hot buttered rum, as well as blending our own gin and vodka to take home and try out. Although they don’t offer private blending masterclasses, they do offer one for 6-20 guests at around £30 per person. They're open six days a week, and also do food. Head down there for some serious crazy flavoured cocktails. It's my birthday this week, and so I thought I'd share a few things that have been on my wish list for a while. I've had my eye on this Carry-on suitcase by Away for so long. It's pricey, but I travel a lot and it has some many features I could really benefit from! 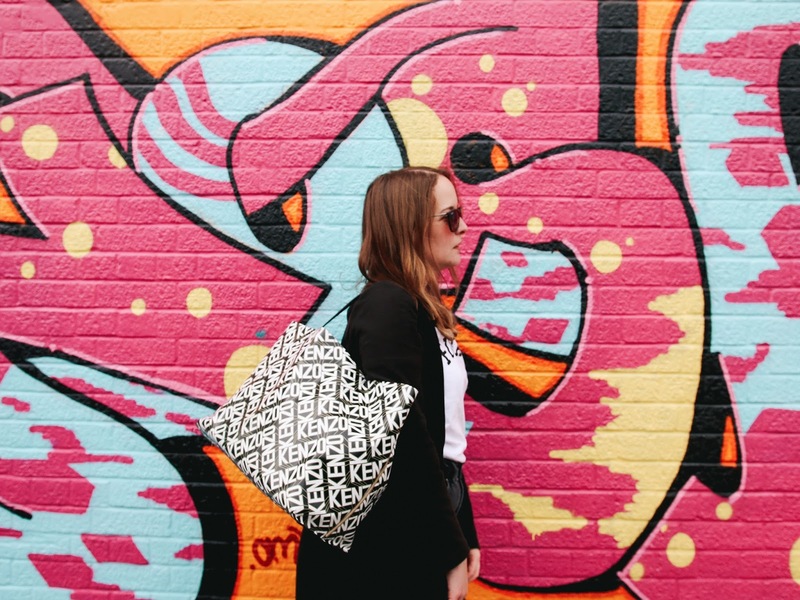 The handbag by Danse Lente is also a piece I've had on my radar for a long time! I see a handbag as a good investment, and this one is perfect for all year round as well - my kinda bag. I'm itching to have a holiday - it's been well over a year since I last went away on holiday - FYI, work trips abroad are great and all, but an actual trip to somewhere where I can escape and do sweet FA is the actual dream right now. Over the last couple of months, I've fallen back in love with reading. I love a good book but can find it so hard to stay focused that reading can be a little tricky sometimes. I've had a few days off over the last month, and with the weather being fairly glorious I've managed to make the most of it on weekends and in the evenings after work by going and sitting on the beach with a book. I'm trying to get out of the habit of having my phone glued to my right hand in the evenings, giving my thumbs a break from all the scrolling, and stepping away from the Net-a-Porter and Topshop apps in the hope I'll stop spending. If I score a right page turner, I can read a book in a weekend and that's exactly what happened with The Power by Naomi Alderman. This was the winner of the 2017 Bailey's Women Prize for Fiction, and I literally couldn't put it down. It’s a worthwhile and clever exploration, accessible to everyone, with an important message behind it: there’s good and bad on both sides. Another book that get's your mind thinking, is Margret Atwoods The Handmaid's Tale. This isn't a new book at all, but you may recognise it as it's recently been made in to a TV series - one that I have recorded and ready to watch. This was another book I sailed through and won't give anything a way - I'm just hoping the TV series is just as good. A little different to my first two, but Mad Girl by Bryony Gordon is one that everyone should read. Having been going through various mental health issues myself, I have never related to a book as much as this one. It's powerful, heartbreaking, hilarious and inspiring all in it's 304 pages. Bryony Gordon is brilliant and somehow manages to take the whole taboo of mental illness away. Ok, so this book is a little different to anything I've ever read but, Gut: The inside story of our body's most under-rated organ by Giuila Enders is definitely an eye-opener. I've only read the first couple of chapters, as it's one of those books you can dip in and out of but, it does get you thinking about what you put in your body. Friends of mine recommended it - they've even gone veggie after reading it, and there's a whole chapter dedicated to pooing properly. Yep, I said it (and it turns out we're doing that side of our toilet visits totally wrong). There's no hiding the fact that Brighton is full of amazing places to eat - it's a struggle to keep up with all the new openings and pop-ups, and I live here! Baby Bao have been a regular at Friday's Street Diner for a while, and now they have taken up residency at Brighton pub, The Pond. Serving up their take on Taiwanese street food in the form of steamed buns and small plates. The Pond in Brighton just so happens to be a mere 5 minute walk from my office - perfect for lunch or even an after-work snack (or stay longer and have a feast!). Between two of us, we ordered a couple of buns and and small plates to share, and came away pretty full. The portions are a great size and the buns are perfection. They're also less than a 5 minute walk to Brighton station, so perfect for a pre or post train snack. Beats grabbing a bag of crisps and a sandwich from M&S. At Aloft Chicago City Centre. Located in the River North area, Aloft is part of the Marriott Hotel Group. The beds are one of the most comfortable I've slept in, and the location is perfect for exploring the city. At so many places! 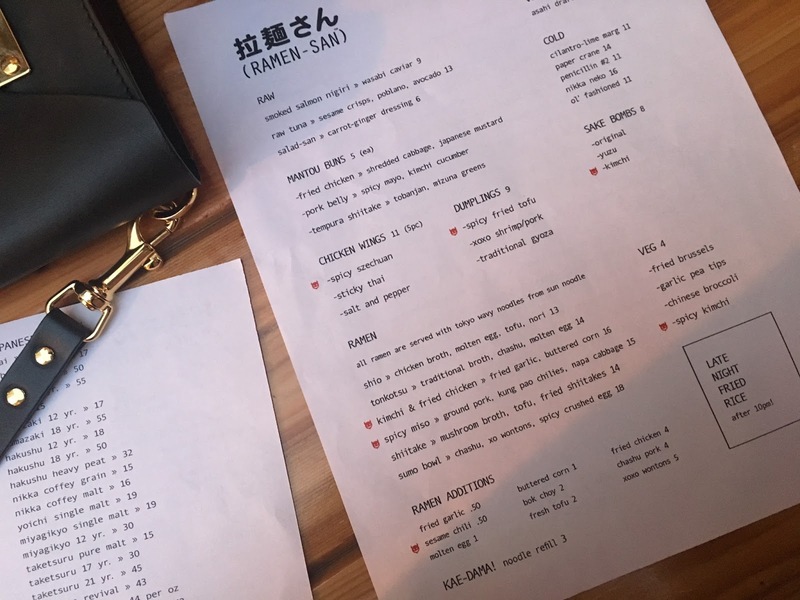 From breakfast at Beatrix to Dinner at Ramen San, Chicago has some great places to eat. Try Firecakes for yummy doughnuts and Wow Bao - an Asian fast food chain that serves up delicious buns, noodles and bao. Till you drop! I mean, if you follow me on Instagram and saw my 'IG Stories' whilst I was out there, you'll know I went to the beauty mecca that is Sephora! I mean, the store I hunted down on N. Michigan Avenue is the biggest one I've come across...ever! (and I've been to a fair few). Not that I went shopping properly, but the city is home to all US brands, including Macy's, Target and J Crew. You'll also find Topshop, Zara and H&M nestled in. Everything! I was actually surprised at how amazing Chicago is, and hope to go back next year. The architecture is insane - prepare yourself for neck ache as you'll be looking up in awe everywhere you go. I would highly recommend booking yourself on to one of the Architecture boat trips - you won't regret it. Also, head to Millenium Park for a stroll and find the silver bean by Anish Kapoor and grab a drink along the river, or if you're feeling fit - go for a run along there. The river path is a great place for it. If I get the opportunity to head back to Chicago, I'll definitely be adding a couple of extra nights on to explore the city further. I'm not sure if it's a getting old thang, but I find myself lusting over homeware pieces more often then clothes! But, when the British high street has so much on offer, and at affordable prices, it's difficult not to. 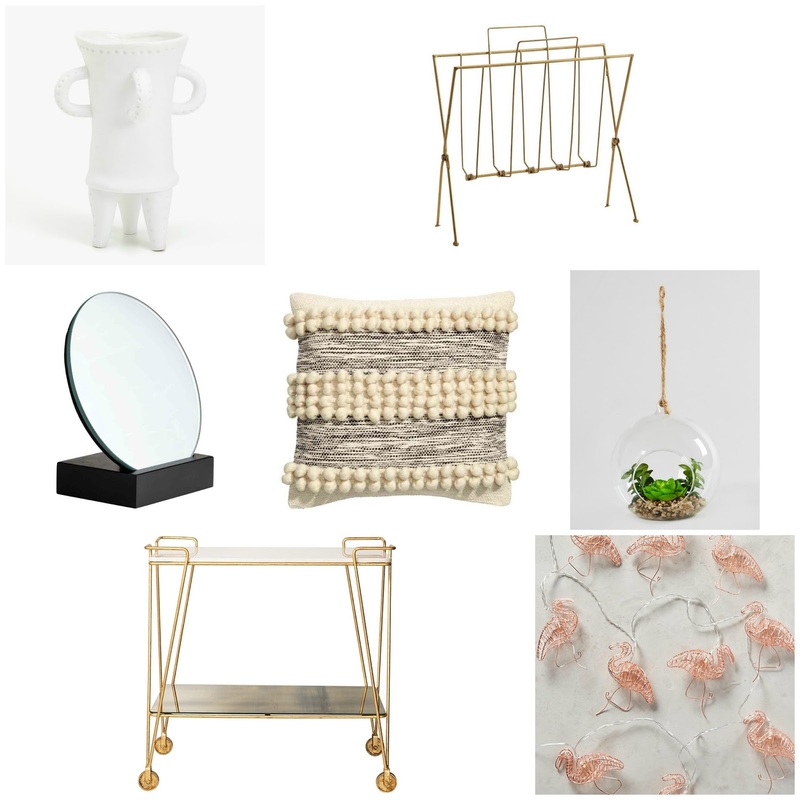 Above are my favourite homeware pieces I have my eyes on - you won't believe where the hanging glass plant is from! It's taken a few stressful, emotional life situations to realise that taking some time out is not just important for the mind, but also for the body. My body and mind have been through a lot off and on over the last few years, and it's not until you experience the type of stress that affects every part of you, that you realise how serious it can get. Hands up, I'm not the most proactive person to admit that I need some time out - it can get to a point where I'm walking round like a zombie and crying at the fact we have no milk in the house until I realise I need to chill the f out! I'm starting to become a huge believer that giving yourself a pamper is perfect for your body as well as your mind. The best place to start for this, is running a bath. Splash out on some nice bathing products, and jump in! Bring a book or listen to your favourite podcast whilst you lie back and relax. I try and have one of these evenings once a week - usually a Sunday. You’re relaxing on your own naked terms. Hell, light a few candles but only if you can relax without worrying that you're not going to set fire to your hair or the shower curtain. I've been lucky enough to live near the sea my whole life and for as long as I've been allowed out of the house on my own, I've always gone for a walk along the seafront and sat staring at the waves when life has felt a little stressful. Going for a walk, and getting some fresh air into your lungs works wonders. Heck, I even pop out of the office if I'm having a stressful day at work, and go for a walk round the block to clear my head. I’m on my computer all day long, and if I’m not on that, I’m scrolling through my phone. So when I get home, my brain needs a break. It's easy enough to sit at home in the evening staring at my phone or laptop, so I’ve been making an effort to unplug for a couple of hours. I’ll leave my phone in my bedroom for an hour or two and I’ll pick up a book or I'll hang out in the kitchen cooking dinner - anything that keeps me away from my social media. This has helped my sanity tremendously. There’s nothing better than getting home from work and changing into a comfy t-shirt or my favourite pair of sweats. Changing out of my work clothes tells my brain that it’s time to relax, and that I can enjoy a few hours to myself, without the stress of work weighing on my shoulders. What are your favourite ways to relax? As you know, I travel a lot with my job and as someone who gets excited about seeing a new city as much as being back on that plane home, it's safe to say I'm a bit of a homebody. As I'm usually away for a few nights, I like to try and make the hotel room I'm staying in as homely as possible. I'm a big creature of habit, and I like to keep to a routine as much as I can so I like to pack a few items in my luggage to make that process of being away from home as nice and comfortable as possible. I don't really like bedtime when I'm away - it makes me miss the husband a lot and I find that even if my hotel room has the comfiest of beds, I struggle to settle - no matter how tired / jet lagged I am. The first thing I chuck in my suitcase when I'm packing, are my PJ's. It's something I wear a lot of around the house - as soon as I'm home and don't have any other arrangements for the rest of the day, my PJ's are whipped out and straight on. There's nothing like a pair of slouchy bottoms with an elasticated waistband to get you feeling comfy and relaxed so I tend to take my favourite pair with me on my trips. I'll also put my white noise app on as it relaxes me quicker and sends me off to sleep fairly quickly! I do try to keep the same kind of routine as I have back home, but as there is always going to be that pesky luggage weight allowance to stick to, I tend to pack my travel-sized skin products, or decant the ones I use at home in to my handy tubs and tubes from Muji. Sticking to a routine is key for me whilst I'm away - I find I settle in to away-from-home life a lot quicker. Well, this one is a little rare when I'm on a work trip! But, I do try to take at least half an hour in the morning before heading out, or in the evening before bed to just chill. I tend to take a travel-sized candle away with me - Jo Malone and Diptyque are my favs for this and, my current book I'm reading. It's payday this weekend, so it's totally necessary to go shopping, right? I'm a little over the Summer sales. To be honest, I've never been a huge fan of them and always head straight to the 'new in' section instead of the sale, so everything you see above is full price and, totally transitional for the upcoming Autumn. That's how I'm justifying it anyway. 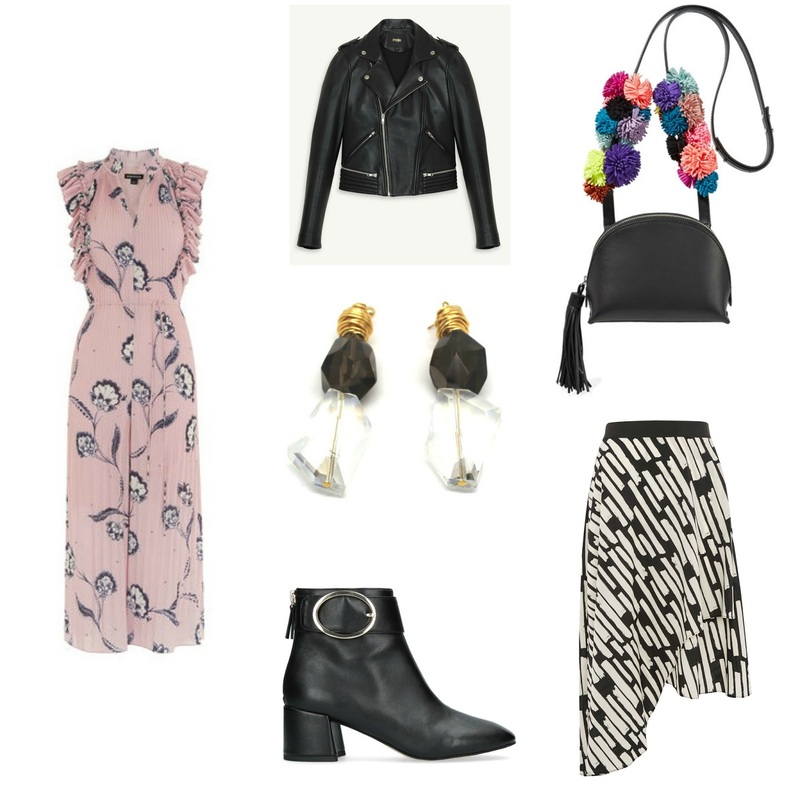 The jumpsuit of dreams would be perfect for a Summer wedding or party you may have coming up - pair with the leather jacket for a 'tougher' look - something I love to do!